News of the deterioration of Chávez´s health has Venezuelans increasingly worried. While top government officials and opposition members were meeting behind closed doors in early December to discuss their next steps, other important discussions were taking place amongst grassroots activists on the future of the Bolivarian Process. Far from the hustle and bustle of Caracas in the lush mountains of the Sierra de San Luis, Falcón State, some 200 Venezuelan community organizers and activists met November 30-December 2, 2012 to debate proposals for the future of the revolutionary state. The occasion was the first congress of the National Network of Commoners (Red Nacional de Comuneros, RNC). Formed in 2009 with the goal of uniting 16 already-existing communes, the RNC today encompasses over 80 communal ‘processes’ including communes, communal cities, communal territories, direct social property enterprises, direct exchange markets, political training schools, community media groups, revolutionary collectives, and individuals. The network aims to connect and expand the participatory experiences and provide the movements with a space to articulate their vision of socialism. The objective of the first congress was to debate this vision and develop a proposal to present to the Chávez government in early 2013. The idea of the commune is inspired by the experiences of indigenous and Afro-Venezuelan people, as well as socialist ideas and the work of Latin American Marxist thinkers such as Peru’s José Carlos Mariátegui. In theory, the ‘communal state’ is supposed to eventually replace the bourgeois state. The new state will be subordinate to ‘popular power’ and overcome the division between ‘civil society’ and ‘political society’ that underpins the capitalist system. The emphasis on grassroots participation is also seen as a departure from the undemocratic, centralist tendencies of some previous socialist experiences . In practice, the communes group together all communal councils and other community organizations in a given geographic territory. Communal councils are community planning bodies that encompass 150-400 families in urban areas and about 20 in rural areas. The communes aim to prioritize and address community needs. The national government transfers funds directly to the communes to execute projects, without the intermediation of state or municipal governments. The communes also advance the socialist economy by bringing production and services under direct community control. Many communes operate their own banks and community enterprises. For example, El panal 2012 in Caracas’s militant 23 de enero neighborhood is packaging and distributing sugar and grains. 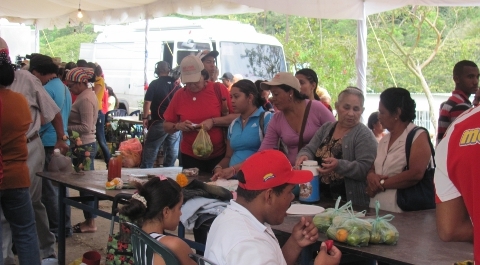 The Juana Ramírez commune in Antímano parish runs its own bakery and condiment and cleaning-supplies factories. These initiatives ensure that prices remain affordable and that goods reach the people. (In Venezuela, opposition-dominated distribution cartels have frequently withheld supplies of essential products as a form of leverage against the government). Communes in the states of Lara, Portuguesa, and Yaracuay are also tackling the challenge of food self-sufficiency. They are constructing a Communal Network for the Production and Distribution of Food, which also promotes organic production. Finally the communes are seen by the comuneros as a ‘classroom’ for political ideology and learning about self-government. Given that bureaucrats in the bourgeois state are not interested in reducing the state’s power, the creation of the communes hasn’t been easy. Debates rage on the relationship between ‘top down’ and ‘bottom up’ initiatives in the Bolivarian process. As social theorist Dario Azzellini  explains, those who embrace the top-down view see the state as the primary agent of change and the ‘popular power’ (communal councils, communes, etc.) as part of its administration. Most within the National Network of Commoners would subscribe to what Azzellini calls the ‘bottom-up’ perspective, which views the Chávez government as creating the enabling conditions for building popular power, but sees the ultimate goal as moving beyond the (bourgeois) state form. Several community orgainizers told us that the government moved too quickly in mandating the creation of the communes; it would have been better to wait until the communal councils were stronger and activists had had a few more years of political and ideological training. The ultimate problem, however, is that “no government wants to destroy itself,” as noted by Atenea Jiménez, one of the network’s most active militants . The relationship of the communal organizations to the existing representative institutions remains an open question and even many Chavista mayors and governors are critical of the communes because they are threatened by the prospect of ceding power to the communes. As Jiménez explains, since the autonomous forms of organization they are advancing in the network pose a threat to people in power, they are often overlooked, for example by local and state media. Many of the longest-running and most successful of these experiences are in Falcón state, where the conference was held. There, the communes have self-organized into a ‘confederation’ as a way of connecting and extending popular participation in the state. In the Sierra de San Luis, the congress site, the idyllic scenery and tranquil ambience belie a radical history. The area is birthplace to José Leonardo Chirino, a black revolutionary who led the first insurrection against the Spanish and fought to abolish slavery. In the 1960s, Falcón was also a locus of guerrilla struggle. Today, one of the Falconians’ most powerful weapons against oppression is the trueke. Trueke is an alternative economic system based on direct exchange of goods, services, or knowledge. Some 150+ pro-sumidores (pro-sumers or producer-consumers) participate in the money-less market. They also created an alternative currency called the zambo to kick-start the exchange. The important thing is not the lack of currency, as some Falconian commoners explained to us. The objective of the trueke is to foster non-capitalist social relations by eliminating wages and the generation of profit. Through these, and other experiences, the Network of Commoners is learning to govern by governing. “We are new political subjects, attempting to govern ourselves” explains William Gudiño, a long-time militant active in the network. They nominated a committee to compile the proposals, which will then be debated in each commune. The final proposals will be presented to the government in early 2013. It is the afternoon of Saturday, December 1, and the relaxed atmosphere seems somehow incoherent with the urgency of the subject matter. Around the discussion circles children are playing and stray puppies hang around, hoping for a fallen treat from a distracted debater. Several participants munch pensively on mandarins. They have saved one of the congress’s most pressing topics for last: the creation of the communal state. The facilitator begins by explaining to the group that the historic role of the state has been as a vehicle for one class to oppress the other. Their challenge, he explains, is to think about a new kind of state that embodies different social relations. The diversity of the group becomes immediately apparent in the discussion that follows. Indeed, the network’s membership is ideologically heterogeneous, with members identifying with Marxism, anarchism, and various strains of socialist thought, as well as representing different sectoral interests, such as environmentalists, labour organizers, and indigenous rights activists. So, participants have different views on the role of the state in the transitional process, and of the necessity of representative government. Most of the congress’s proposals centered on the creation of a national assembly of commoners, which would unite one spokesperson from each commune, as well as possible representation from sectoral organizations such as labour federations. They also discussed the creation of a communal state department to articulate with other organizations in the region and globally, with the goal of combating imperialism and working to create socialism at the global level. Another proposal was for a national council or commission to examine what they term ‘integral security.’ Insecurity and police corruption are perennial concerns in Venezuela leading many participants to call for a new model of security based on the people ‘protecting themselves,’ rather than the police and military defending the people. They highlighted the importance of prevention and expanded their definition of insecurity to include threats to local and national sovereignty. The two days of debate concluded with participants agreeing to bring the proposals back to their communities. For more on the National Network of Commoners, visit their blog. Rebecca McMillan and Calais Caswell are graduate students in International Development and Globalization at the University of Ottawa. They were in Venezuela from August-December 2012 researching water and sanitation politics and the role of the technical water committees (mesas técnicas de agua, MTAs) in Caracas. Their research is sponsored the Social Science and Humanities Research Council, the North-South Institute, and the University of Ottawa. Dario Azzellini: “2012 Venezuelan Elections and the Future of the Bolivarian Process” Historical Materialism Conference, November 11, 2012, London, UK. See this article by Atenea Jimenez (Spanish, English translation). 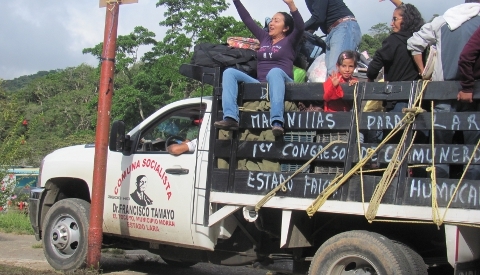 Following the October 2012 elections, Chavez reprimanded his cabinet for the lack of progress on stimulating the construction of the communes and asked his newly nominated Vice President, Nicolas Maduro, “Where are the communes?” In this piece, Jimenez responds that the communes are alive and well but that their work has been under-recognized for various reasons.